Our good friend and one of my most favorite people in the world, JB Dela Cruz, invited us to an evening of illusion and magic. JB happens to be a really fantastic magician! 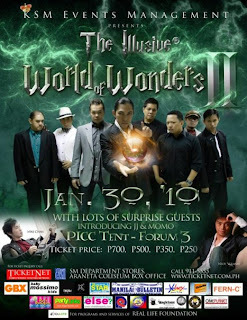 The show was called World of Wonders II featuring The Illusive. The group that he belongs to is called The Illusive. One of the magicians in that group asked Robert to volunteer in one of his acts. If you have been to a lot of children's parties, you have probably seen this act. It is just funnier to me because this time my husband is the "victim" of this really funny joke. By the way, if you are interested in hiring JB as a magician in a future party or event, please send me a private message and I will connect you to him. He is really good! You can also become a fan of The Illusive Group of Magicians on Facebook. Just click here. Hey Sam! I didn't know where else to write this comment.I'm new here! hehehhe Anyways, yeah we always bump into each other! Maybe one time we could sit and have some coffee!